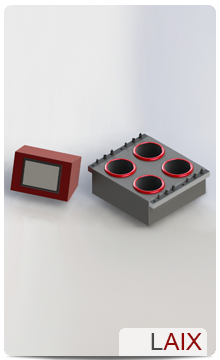 Are you looking for a flexible reaction block for manifold applications? VariSynth might be the answer. 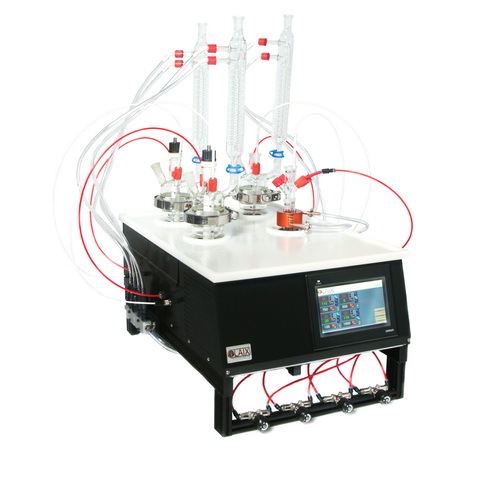 One instrument allows you to run different reactions in parallel from 2 up to 2000 ml. The VariSynth System is available with two or four zones. Each can run a 2000 ml reaction or multiple smaller reactions up to 20 x 2 ml using our special inlets. You can choose between integrated electric cooling to -10°C or a powerful external chiller for lower temperatures down to -70°C. Each zone of the VariSynth works independently. You can run up to four similar or different reactions in parallel without time-consuming preparation. Everything is operated from a large, easy-to-use, colored touchscreen which displays all of the necessary information. The design, colors and functionality can even be adapted to your needs. As a one-stop shop, LAIX also offers a large amount of accessories such as glassware, sensors or stirrers.